Bob Wilton (Ewan McGregor), is a small town reporter for the Ann Arbor Daily Telegram. A man who thinks his life will always be small, like the paper he writes for, but after interviewing Gus Lacey (Stephen Root), a man who claims to have psychic abilities who was part of a secret army force in the 80’s, that tried to create super soldiers with psychic talents. Bob dismisses his claims and believes him crazy. Shortly after, Bob’s wife leaves him for his editor and out of anger and an urge to prove himself to his wife, leaves for Kuwait, hoping to get into Iraq and report on the war. While at his hotel in Kuwait City, he meets Lyn Cassidy (George Clooney), a man he heard about while interviewing Gus Lacey. Cassady is revealed also to be a former member of the same secret unit of psychic spies (referred to in the unit as “Jedi Warriors”), known as “The New Earth Army”. What follows is Bob following Lyn on a secret mission where Bob discovers the story of a lifetime. The Men who stare at Goats is based upon the book of the same name by Jon Ronson and it is one piece of laugh out loud satire. I don’t think that George Clooney has been funnier since O brother, where art thou? He really throws it all out there as Lyn Cassady, the greatest “Jedi Warrior” that was ever in The New Earth Army. I found myself laughing at almost every scene he was in. My particularly favourite scene is when Cassady shows Bob the ‘sparkly eyes’ technique. It’s one of my standout favourites. The film does contain a great ensemble cast, from Clooney, to McGregor, Kevin Spacey as Larry Hooper, the evil ying to Cassady’s good yang in the New Earth Army. But, the standout performance comes from the brilliant Jeff Bridges, who plays Bill Django. A Vietnam veteran, turned hippie warrior monk and founder of the New Earth Army. It doesn’t seem like a big stretch for Bridges, because let’s face it, the guy can play anything and play it well. Seeing him as Django brings back memories of his role in The Big Lebowski as The Dude. It’s almost like Django could be a distant relative of The Dude. The HD transfer is great, with a fresh colour palette and showing off some really beautiful scenery with the rolling sand dunes in the desert and the endless blue sky. No real film grain or noticeable damage on the transfer, it’s pretty much faultless. The audio is very nice, with countless classic rock songs playing throughout, it’s a clear sounding track, like the majority of all modern films these days. Special features on the disc include Commentary from Director Grant Heslov, commentary from the books author Jon Ronson, deleted scenes, codename: Project Hollywood featurette and Goats Declassified - The First Earth Battalion feature. 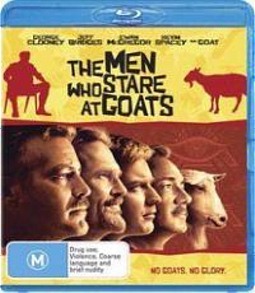 The Men who stare at Goats is an enjoyable, offbeat film, with enjoyable performances and laugh out loud moments. It won’t appeal to everybody, but those people that get it, will love it.